"Best Burgers On The Main Line And Beyond"
Thank you, Philadelphia Magazine for the recognition. The Silverberger is a grass-fed beef patty with onion jam, Swiss and special ketchup on a squishy white bun. The Silverspoon in Wayne is a hidden gem of a BYOB offering a locally sourced and seasonal menu. I had a chance to sit down and chat with Silverspoon’s Chef Tim Courtney, who shared his thoughts on using local ingredients and his appreciation and respect for the local producers who supply him with those products. The Silverspoon’s menus are printed in-house and change on a regular basis. 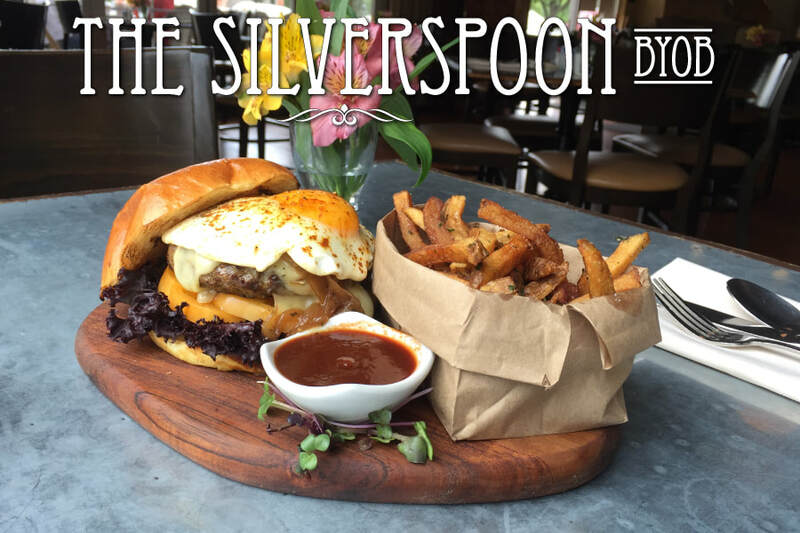 "THE SILVERSPOON SERVES UP A WEEKLY WORLD TOUR"
Every Wednesday they do a World Tour menu that takes diners on a trip to four different places in the world to try out some different types of cuisines. The diners get “passports” and once they’ve done world tour Wednesday four times, the fifth is free. The dinner is $35/pp. "WAYNE'S NEW SILVERSPOON DISHES UP CULINARY GOLD"
The Silverspoon serves three meals a day Tuesday through Friday, breakfast and lunch on Monday, brunch and dinner on Saturday, and only brunch on Sunday. They also do a good deal of catering in the area. "THE SILVERSPOON: A COZY BYOB IN WAYNE, PA"
Tucked away on Lancaster Avenue is a little place known as The Silverspoon. This restaurant is family-owned and operated by the Silverbergs, Rich and Ruth, and their son Ron is the Executive Chef. This is a family-run business, and you can tell. All the work that’s gone into the little details throughout the restaurant, make you feel at home. Along with my wine-drinking buddies, Gerry and John, we have scoured Philly’s Main Line for interesting BYOB’s for our monthly wine dinners. We are not quite sure how we missed the Silverspoon all this time but we are certainly glad we found it last Thursday night. Sequestered away behind georges’ restaurant in Wayne’s Eagle Village Shops, the Silverspoon Cafémay appear to be just another one of those hidden gastronomic gems waiting to be discovered. But – and trust me on this – the Silverspoon is no secret to knowledgeable Main Line foodies. "GLUTEN-FREE NIGHT TONIGHT AT THE SILVERSPOON"
Finding out that you have an intolerance to gluten can be daunting news especially when it comes to eating. But, did you know that The Silverspoon continually offers many selections with these dietary needs in mind. "MOMS NIGHT MINGLE FOR A WORLD TOUR WEDNESDAY AT THE SILVERSPOON WAYNE"
Mom’s Night Mingle for a World Tour Wednesday at The Silverspoon Wayne. For Families or Date Night: Four Courses from Around the World Every Wednesday for $35.